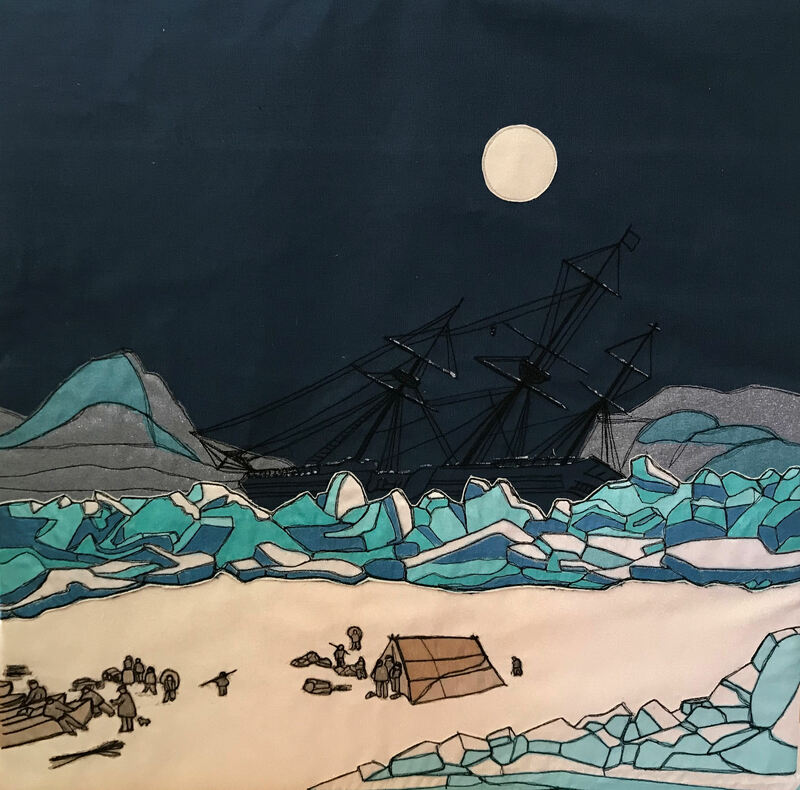 This is one of the pieces in the Verdant Works Exhibition ‘The Arctic Whaling Year’, Autumn 2018. One of the great perils of Arctic whaling was getting trapped in the ice and either having the ship destroyed by being crushed by the ice, or being trapped in the ice and having to overwinter in the harsh cold and darkness, isolated from any help or rescue. The ships did not routinely carry enough fuel for heating or food to overwinter (although following a series of incidents ships were supposed to carry enough supplies to last over winter). There are a number of harrowing accounts of the hardships of being trapped. Probably the most famous account is by a ship’s surgeon aboard the Diana of Hull. This ship was trapped in the ice in the Davis Strait in 1866. Surgeon Smith kept a journal, initially of his observations on the trip, notes on conversations with the captain, and general ship life . 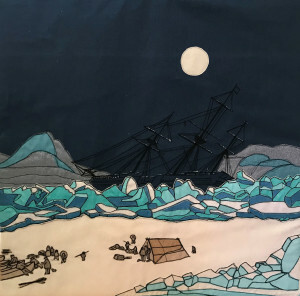 Then as the disaster unfolds he describes coping with the cold and damp, the lack of food, the gradual onset of scurvy and deaths amongst the crew, as well as the regular terror of the ship getting hit by icebergs. After the death of the captain in the middle of winter the surgeon was credited with keeping up the morale of the crew and is remembered in a memorial in Shetland to this day. His journal was published and is still in print today. Beset. Textile panel (60 x 60 cm) from ‘The Arctic Whaling Year’ exhibition at Verdant Works, Dundee, Autumn 2018. Fabric paint and marker pen, layered sheer fabrics and freehand machine embroidery on unbleached and dyed cotton fabric. The wooden ships that went to the Arctic were specially strengthened to withstand collisions with icebergs and reduce the risks of being ‘nipped’ between the moving bodies of ice. The image is based on several paintings of ships beset in the ice. Often the action of the ice lifted the ship out of the water and tilted it at an alarming angle. But these wooden ships were strengthened and could escape with little damage.